Home / Über WP.eu / Publications / Transnational collective bargaining at company level. A new component of European industrial relations? One of the key questions tackled in the book is whether a regulatory framework for TCB is feasible, necessary and/or useful. Perhaps even more importantly: can we, given the proliferation of instances of TCB, actually manage without such a legal system, and what should be the main elements of such a framework? 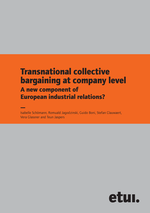 By providing a better understanding and a critical analysis of the emergence and development of transnational collective bargaining, the authors of this book offer valuable help to trade unionists and practitioners in preparing for – and being prepared for – this next stage in the internationalisation of industrial relations.